Tarps Plus carries Tan Canvas Tarps, the tan color is the number one preferred color in canvas tarps. The tan canvas tarp is very popular because it blends in well with the outdoors and the dirt does not stand out much. Tan canvas tarps are on average 12 oz per square yard, mildew resistant, create great shade, strong, durable and many other great qualities that just makes it a fantastic tarp. The Tan Canvas Tarp is also the preferred tarp for painting and home improvement projects. 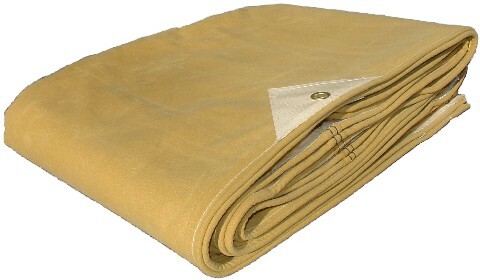 The Tan Canvas Tarp comes in many different sizes and in different colors. The Tan canvas Tarp is the #1 favorite from all Canvas Tarp lineups. Check out the specifications on the tarps plus web page, www.TarpsPlus.com. Many Styles Of Vinyl Tarps New To Tarps Plus! Ice Rink Liners Now On Sale!! Do You Need a Snow Fence? Perfect Time For A Pool Cover!